The Punchbowl lacks the punch: an unfortunate rant about false pretences and the seductive false sense of Instagram security. One of the aims of this ‘food blogger’ status is to discover and try out new places, in the hope of inspiring others to go forth and have delicious times. 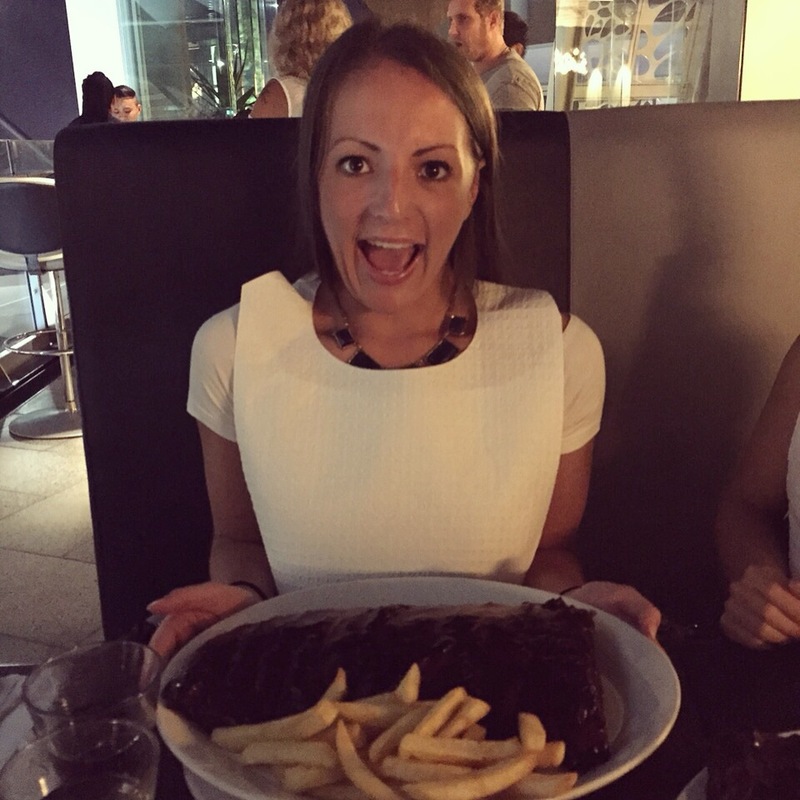 When the short spate of September-October birthday meals comes around, for ‘some reason’ it falls to me to find or suggest the celebratory dinner destinations (the pressure’s now truly on as ‘Han Eats’). Nine times out of ten it’s a gastropub that wins out for a parental/family occasion. We love a good gastropub. I think it comes down to the relaxed surroundings, feeling like you’re in your ‘local’ boozer (that you’ve driven 30 mins into the middle of nowhere to find), whilst enjoying quality food that’s a cut above the rest (the ‘gastropub’ very much fits into my ‘Quality Dining’ category – find them up top). However, we’re in need of newbies. 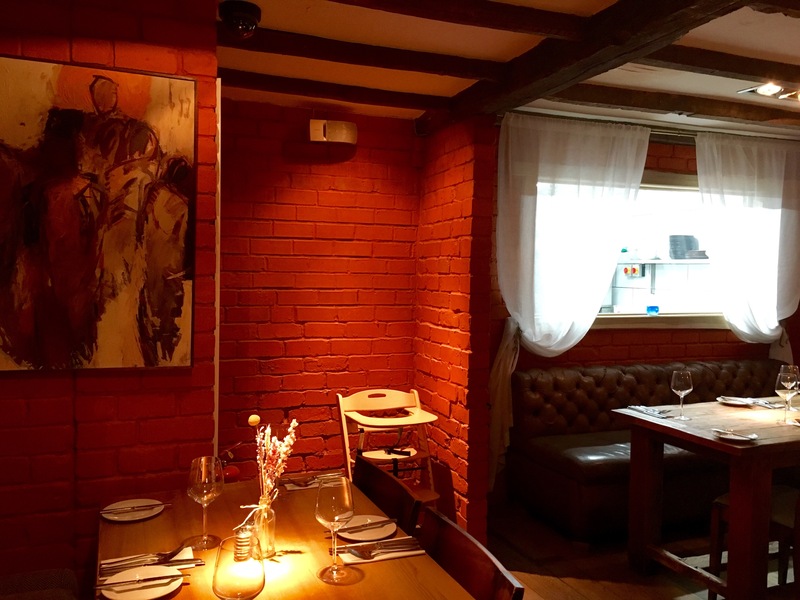 The Punchbowl was therefore recommended to me by a Lapworth resident and friend as the newbie in town alongside the village’s gastro strongholds, The Boot & The Orange Tree. The Punchbowl has recently had a wee refurb. They’ve relaunched with an additional function room which was hosting its first wedding (didn’t hear or see a peep out of them all night which was both pleasing and surprising) and boutique bedrooms are currently being completed upstairs. First impressions were excellent. 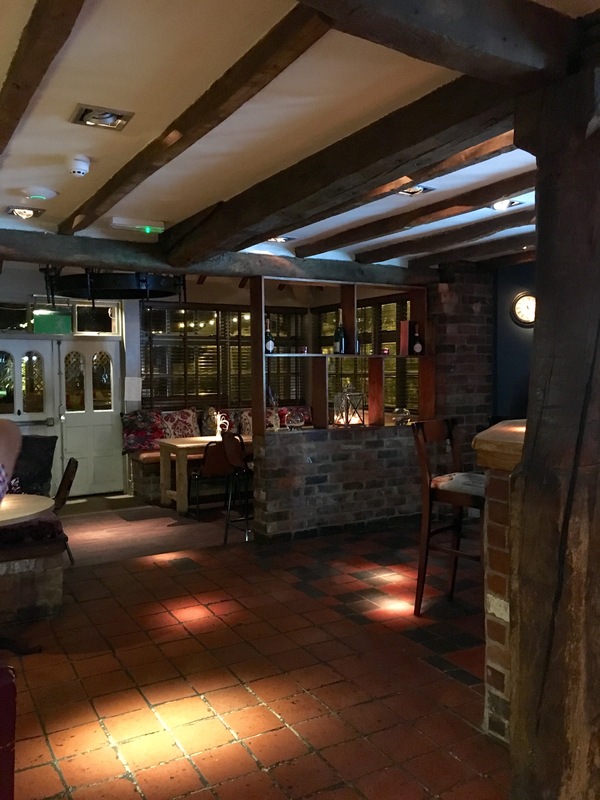 The décor of both the relaxed drinking area and the restaurant area is gorge, a stylish, ‘fashionable’ pub + dining area (again, sorry for lack of decent photos). I particularly liked the window feature looking into the kitchen where you can see (at least) one chef at work – a confident choice. For a Saturday night, the place was calm and fairly quiet. As a larger birthday party of nine, we were by far the biggest table. It did however fill up after 8pm, which I believe was to quash post-wedding kitchen nightmares. Firstly, THIS NEVER HAPPENS. “I’ll order last” is my go-to eating out phrase. Sometimes you’d think I was choosing between life and death. So no surprise as the Mr double-took as I stepped up to the mark and accepted (in my eyes) the waiter’s challenge to be one of nine to order. I inevitably panicked and made a last-minute starter swap – duck to my second mistake… the goat’s cheese. Now specials are a twofold tease in the restaurant biz. Given the title, they can sometimes lure you into a false sense of security that you’re actually having the chef’s ‘special’ dish, something they’re particularly proud of and want to wow the customer with. On the other hand, they can often be last-minute leftover creations in a race against the sell-by date. Now not only did I go for one special, I went for TWO. Kicking myself that I haven’t any evidence for the first course but I can honestly say it was ‘on the other hand’ of the specials-scale: ‘Goats cheese with beetroot on rye’. Now I LOVE goat’s cheese and will often choose this from any menu, usually because it either comes in nice big slices or it’s warm, melty and gooey. Not this time. I’ve never had goat’s cheese served in a similar fashion to feta; crumbled, bitty and sparing. Paired with a slice of dry (if not stale) bread, with some chunky, (tasty) beetroot and a smattering of balsamic, it left utter regret. Ma & Pa also did not like. My first mistake descended into my second. I admit it. I cheated. 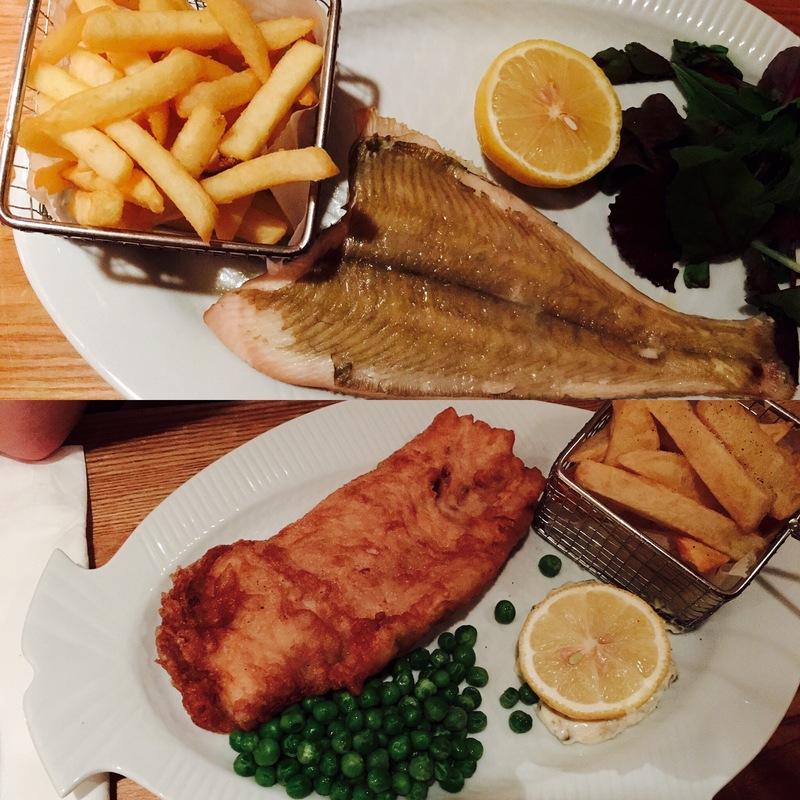 I cheated on my meat-loving self with not only the fish special but an unfamiliar fish… a whole Lemon Sole. Whether this was due to food-festing the very same day so wanting the ‘lighter option’, or in another way trying to resist my gut (literally), I don’t know. All of the above ultimately led to what can only be described as one of the most laughable #firstworldproblems: FOOD ENVY. As a precursor to an upcoming post on the power of social media in the foodie business, it’s almost a given nowadays that if you haven’t got some form of social media presence as a food/drink destination, you’re no longer doing it right. However, sadly this can also go against you. Photographs are sadly not reality (ceci n’est pas une pipe). As devout foodies now do, I look up restaurants/food destinations prior to my visit (sometimes even during #menustruggles) via the newfound search engine for foodies – Instagram. From what I’d seen of Insta-Punchbowl, as above, I was expecting frills and flowers. I don’t think I’m naïve in suggesting that when food is instagrammable, it’s generally also pretty tasty. This food was neither. It was a bit of a letdown 😦 Suffice to say I have yet to Instagram any shots from this meal… A rarity in the Han Eats Insta cycle. 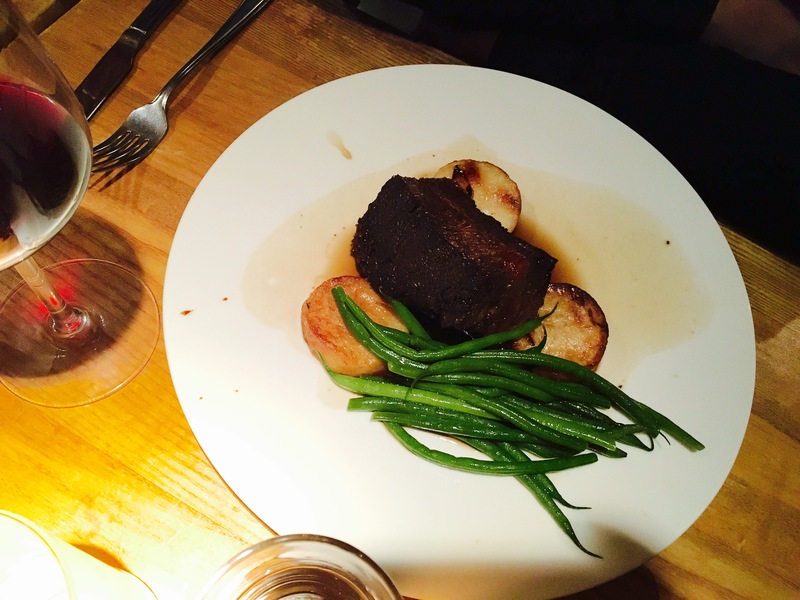 For the price paid, and the extravagant surroundings, the food really was underwhelming. Plain, clumsy presentation and the kitsch fish-shaped plates aside, the dishes were bland. No flavour added to the sole, no spruced up peas, a limp, last-minute garnish – nothing compared to what I had seen online. 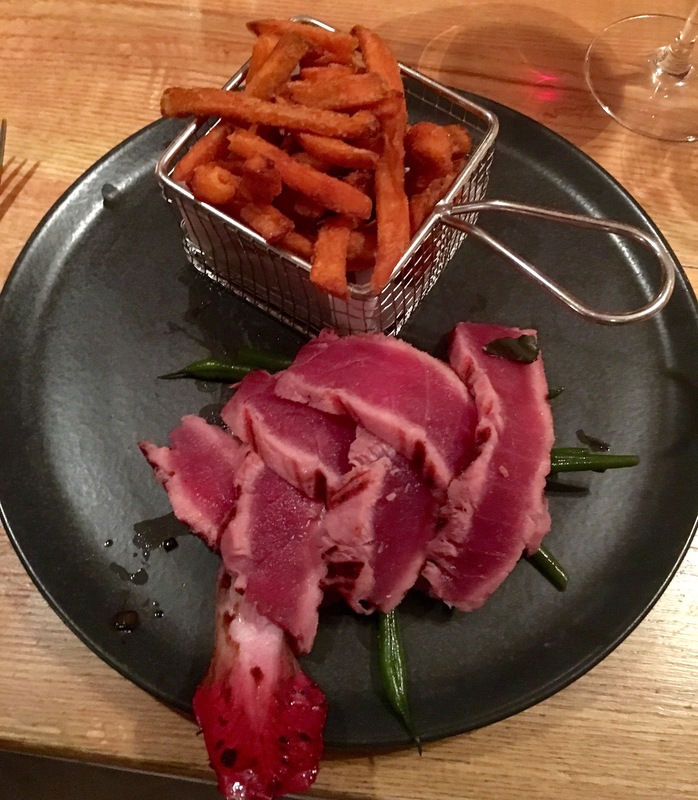 Despite the #FOODENVY when the below dish arrived next to me and the general tastiness of the tuna, there were no additional flavours to excite the palate… A few spare green beans and radicchio hardly did it justice. On the flip side, this was ordered rare, medium and well-done by separate members of the party and came out (eventually) true to order and taste. Dessert aside, all of the main course dishes didn’t come close to expectation, either through taste or presentation. 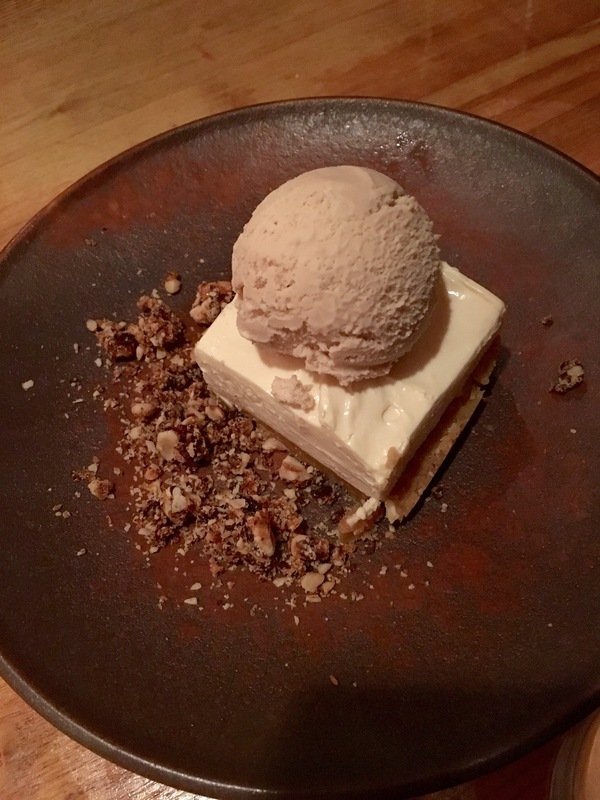 Highlight was definitely this Baileys & malted milk cheesecake with delicious hazelnut ice cream – this really was a delicious dessert between three. Unfortunately, for me and my party on this occasion, The Punchbowl really lacked the punch. I want to say it was all my own fault and the fish infidelity led the review down this path. Maybe the kitchen was overrun or understaffed following the wedding earlier on. Maybe the head chef, who proudly shows off his hard work at The PB here on Insta, was off sick. Maybe we missed the ‘the good old Punchbowl days’, captured and forever frozen in the Instagram back catalogue of 2015. Maybe I’m no longer ‘famously unfussy’, however sadly others around the table also voiced the same disappointment in the post-meal evaluation. Following a villager’s recommendation, it’s not great to have to feed back that the place was ‘just ok.’ As much as the disappointing aspects of the meal did not dampen the birthday celebration, it doesn’t bode well for her feedback to fellow villagers. A bit like my review of Meating, The Punchbowl is another destination I really want to urge to listen to feedback. It could really be worth the 25 minute journey from Coventry, the third Lapworth pub musketeer. I really wanted to rave about it as a new gastropub to enjoy, but at the moment I just can’t. 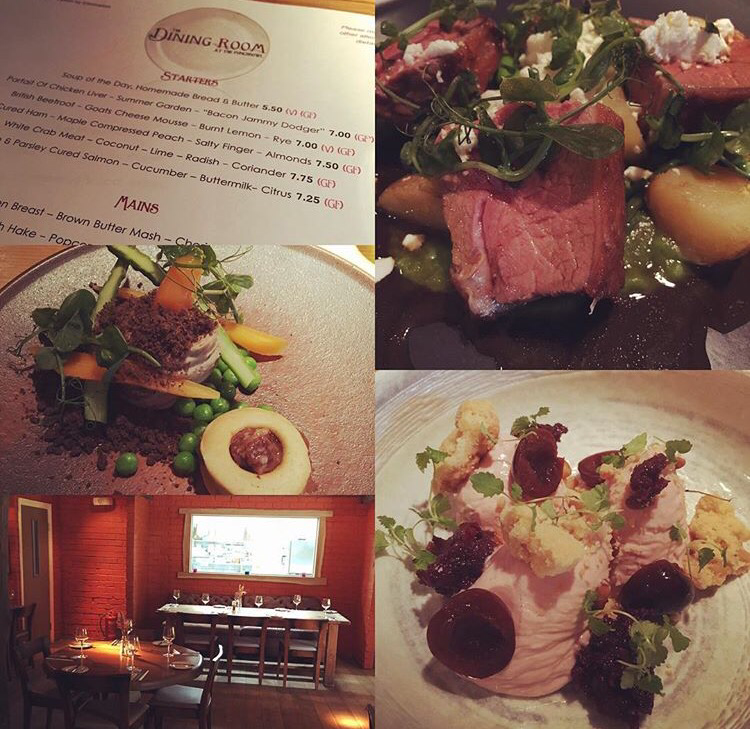 So to finish, I’d like to say to The Punchbowl: at the moment the gorgeous refurb (and Instagram accessories) are punching well above the overall food experience in reality. We’ve since visited The Hatton Arms (review coming soon!) for another birthday celebration and the food was on another level, for a pub that should be on a level for its similarity in décor, price and menu. I would also have appreciated a birthday mention for my dad following my call ahead to mention during the day, be that verbally or via a small decorative gesture or dessert (see Anderson’s and Robata for inspiration). After all, you are trying to sell a re-opening of an occasion and destination venue, somewhere I believe could be worth the journey. It would be in the venue’s interests, with future weddings in mind, to urge that these details are looked at and reconsidered.